A no brainer, especially because there is a starter deck based around it, will we see this deck being played. The deck is typically Altaria/Garchomp but I’ve played against some variations. Hydreigon with consume (40 damage heal from this Pokemon as much as you dealt.) was surprisingly tough to play against. The biggest hold up you can cause this deck is getting their Gibles and Gabites early on. 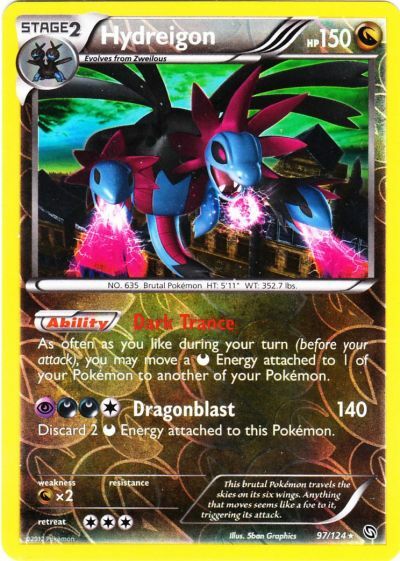 The deck is shy on searching because of Gabite’s dragon call ability. Something obvious that I had been over looking is Emolga’s ability to KO Swablus. Typically people run Emolga for his Call for Family attack but Spark one hit KO’s Swablus all day. Also you’d think you’d want to knock out their heavy hitter, Garchomop. But in reality killing their Altaria is much more of a blow. Shut down their support system and level the playing field. So we’ve established in the game that Darkrai EX is really flippin good. Paired with Hydreigon’s ability to move around dark energy, it’s amazing. Everything has free retreat. Easiest way to melt the chocolate? KO Dino quickly. The list plays four max potions so that you can move energy off Darkrai, Max Potion away all the damage, and move all the energy back and keep attacking. Similar to Dragons this deck relies on it’s benched support Pokemon to run smoothly. Watch out for Sableye as well. His junk hunt ability keeps this deck floating, he may look like a poor play choice or an easy KO but cycling back in a Pokemon Catcher or a Max Potion makes it well worth giving up a prize. This is the deck that dominated in Japan and should be expected to show face in the states. Alright so this is 100% my own intuition pushing me in this direction. Both the decks above will be played and I’ve given you some tips on how to handle them. The very best way to handle those decks? Turn off their abilities. No Dragon Call, Fight Song, Dark Trance, Dark Cloak means no deck. Garbodor does exactly that, if he has a poke-tool attached. Which is fine as long as you run Tool Scrapper to counter it. Oh… none of the lists I’ve mentioned above make room for Tool Scrapper? Wah-Wah. Garbodor, 100hp 3 retreat, is possible Pokemon Catcher bait. Darkrai with a dark claw kills it and Garchomp can one hit KO it. Though that’s true, shutting off any of these abilities for a few turns won’t hurt. The deck list I’m envisioning plays Retaliate Terrakions, Mewtwo EX, really any good stand alone Pokemon without an ability. I’m not guaranteeing you’ll see a list like that but if I were going into a Battle Roads playing a rogue deck this smelly dude would be a key player. Good luck and let us know how you do at Battle Roads!